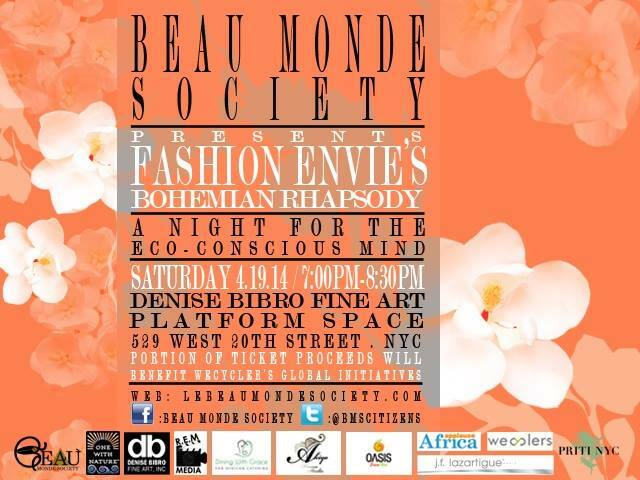 New York City, NY – March 27, 2014 On April 19th, 2014, Beau Monde Society will be presenting its second installation of Fashion Envie during Earth Week in New York City at Denise Bibro Fine Art Platform Space located at 529 West 20th Street from 7:00PM – 8:30PM. This year’s eco-collective theme isBohemian Rhapsody. Fashion Envie – Fashion, Environment, and Life is the brainchild of Beau Monde Society’s founder, Jennifer Nnamani. Beau Monde Society firmly believes in social responsibility, personal well-being, and creating an “out-of the-box” style that will foster sustainable inspiration. Fashion Envie presents a F.U.N (Fashion Understanding Nature) perspective of fusing eco-friendly fashion and art. This imaginative celebratory environment is for the unconventional and socially conscious to imagine a world free of waste–supportive of local artisans. Tags: Beau Monde Society, Earth Week, Eco-art, Ecofashion, EcoFriendly, Ethical, Fashion, Fashion Envie, JWhite Original, Katra Awad, Oasis Juice Bar, One with Nature, press release, PRITI NYC, Silly Simone, sustainability. Bookmark the permalink.